The annual Christmas prize draw at Lodge St. Andrew (Denny & Loanhead) No. 176 certainly covered various parts of the Province of Stirlingshire. There were 25 prize up for grabs when the draw was made at the Lodge premises in Denny. The top prize of £300 was won was by Bro. Robert Forrester, a member of Polmont No. 793. He lives in Stenhousemuir but bought his ticket at Whins of Milton in the newsagent shop run by Willie Turnbull. Bro. Willie was the top salesman and at a recent Lodge meeting was presented with a bottle of malt whisky by RWM Robert McLaren in recognition of his sales effort. He actually sold 10% of the total tickets so it was fitting that five of the prizes were won by Willie's customers. 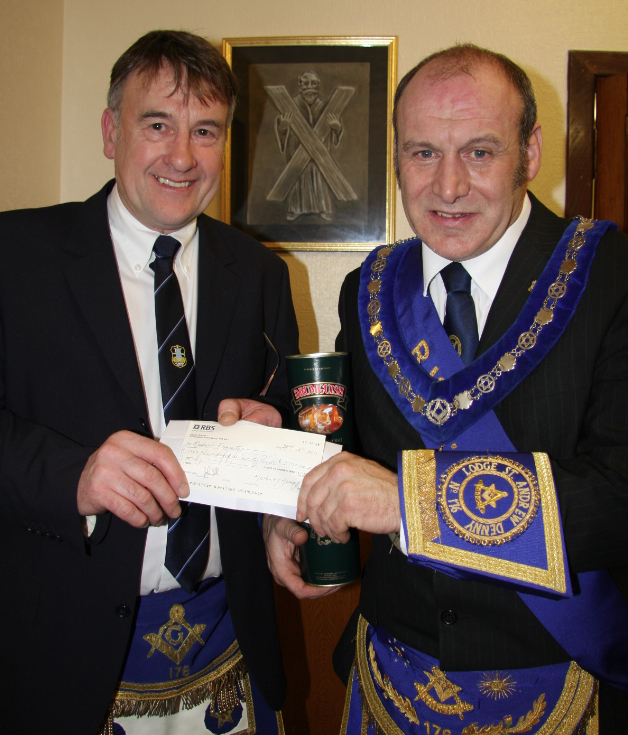 And in true Masonic fashion, Willie has donated his malt to the fund raising efforts of 176. Bro. Robert Forrester couldn't make the meeting and asked Willie to pick up the prize and instructed him to donate 10% back to the Lodge. So it was winners all round and real example of brotherly love in action.